At the northeast corner of the harbour are the fortified batteries of 1821, still furnished with some of their can non. 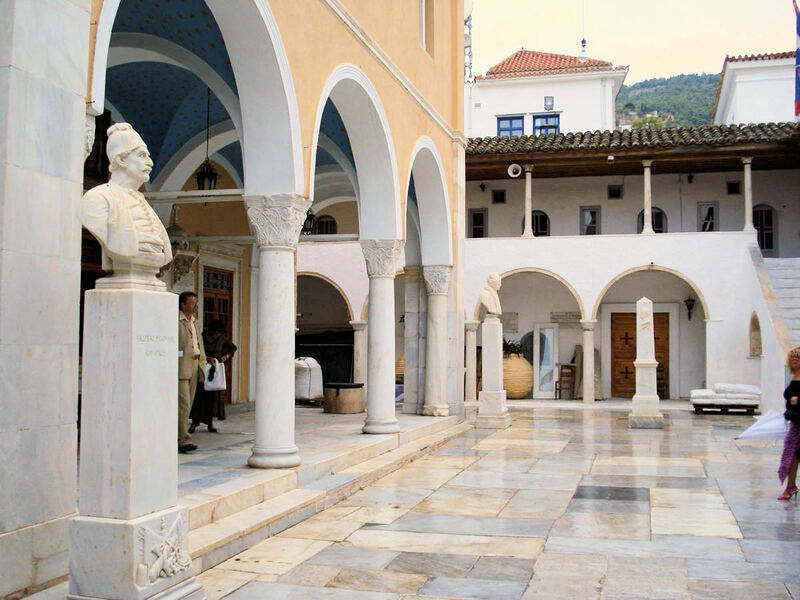 On the upper level is the bronze statue (1892) of Andreas Miaoulis by Konstantinos Kazakos; on the lower level, a bust Antonios Kriezis (1796–1865), a Hydriot na val commander who fought in the Greek War of Independence and was later Prime Minister of Greece, under King Otto, from 1849–54. 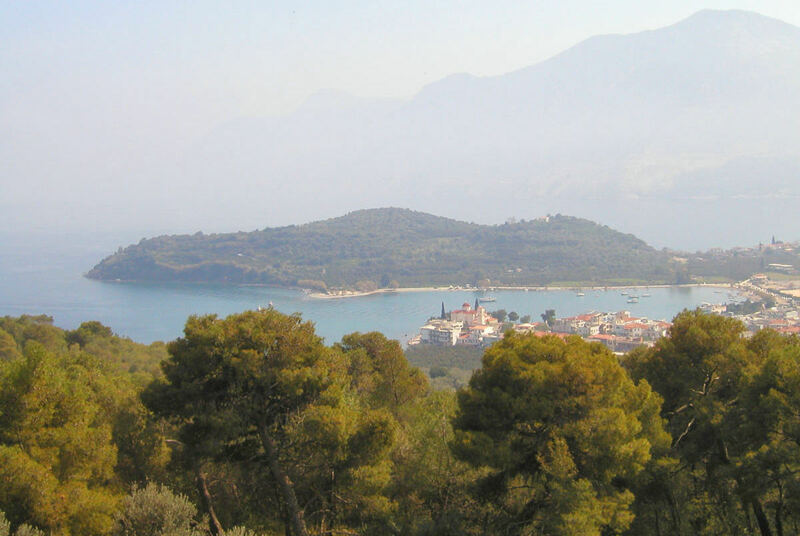 Andreas Vokos Miaoulis, one of the most sympathetic and interesting figures of the Greek revolutionary war, was born on Euboea, but considered himself a citizen of Hydra where he settled and lived. He was a highly skilled mariner in the merchant navy and by the age of 17 had become captain of a commercial ship, acquiring considerable wealth in the corn trade through a series of courageous sea operations during the blockades and difficult conditions of the Napoleonic wars. In 1822 he was appointed Admiral of the heterogeneous Greek revolutionary fleet, which had been hastily improvised from converted merchant ships: over half the ships were from Hydra itself, and he would have been familiar with them at first hand. His first mission was the avenging of the Turkish Massacre of Chios in 1822. With far inferior resources at his disposal, he succeeded in harrying and impeding the movements of the Turkish and allied Egyptian navies. He played a crucial role in the relief of the first siege of Messolonghi in the winter of 1822/3. As the revolutionary war against the Ottoman Empire intensified, with the involvement of larger players— Britain, Russia and France—Miaoulis stepped back to allow one of the most successful andenious veterans of naval action of the time, Thomas Cochrane, Earl of Dundonald, to take command of the Greek navy. Dundonald was a colourful, talented, but controversial personality: he had been relieved, probably unjustly, from his command in the British Navy in disgrace, and had since acquired considerable experience serving with revolutionary fleets in Chile and Brazil. Perhaps there was something in the outspoken fearlessness and independence of thinking which the two men shared, that led Miaoulis to cede his control. Miaoulis maintained an active role in Greek affairs after the War of Independence, and became involved in the open hostility of Hydra to the increasingly arbitrary power of the Russian-dominated faction of Ioannis Capodistrias, which threatened Hydra’s prominent position in Greek maritime affairs. 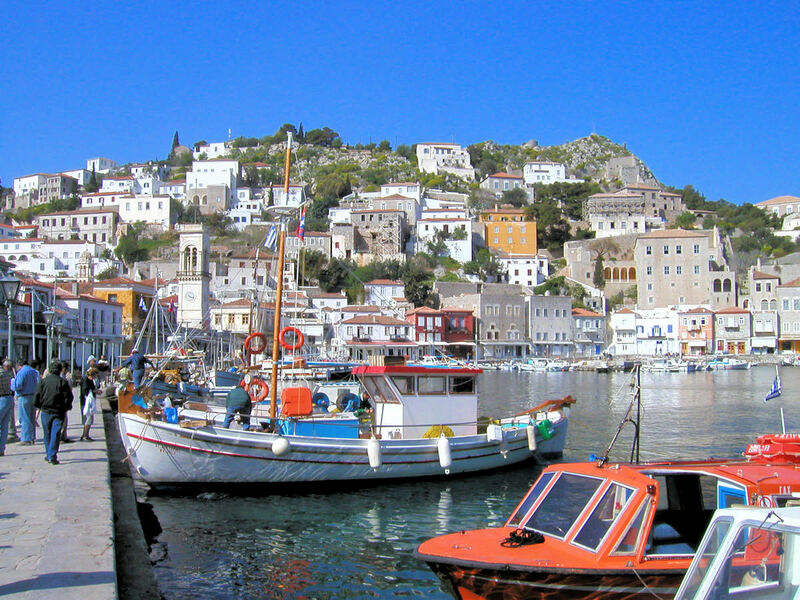 At the instigation of the Hydriot council, in a daring act of what was in effect sanctioned terrorism, Miaoulis forcibly took control of the Greek Fleet in the harbour of Poros in July of 1831, and in August destroyed two of its ships, including the flagship Hellas, rather than hand it over to the Russian command as Capodistrias had requested (see Battle of Poros, pp. 108–111). 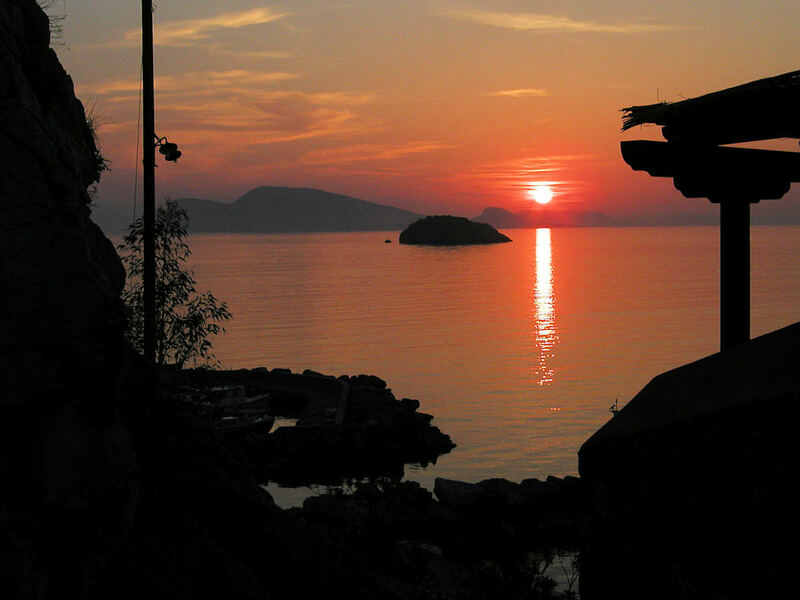 Shortly before his death, he was once again appointed Vice-Admiral of the Greek Navy. His heart is pre served in a small shrine in the Museum of Hydra. 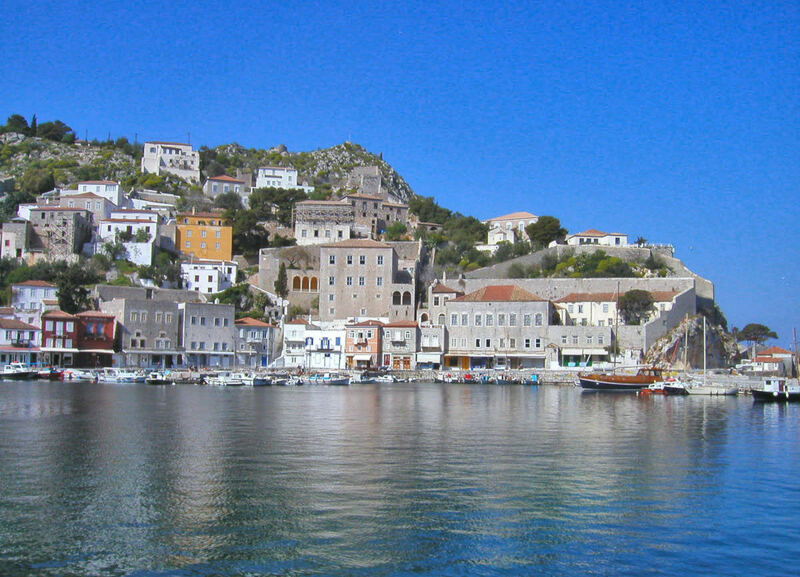 The large building overlooking the harbour, just south of the battery, houses the Museum of Hydra, a full and well displayed collection of memorabilia of Hydra’s maritime glory. (Open daily 9–3.). The prevailing spirit of nostalgia, and the flamboyance of the naval personalities and events which the museum commemorates, are an illuminating contrast for the Anglo-Saxon visitor, accustomed to the different culture of imperturbability and ‘stiff upper lip’ in the northern European naval world. Entrance foyer. Immediately left, by the entrance to the museum shop, is a display of Mycenaean finds, including the modelled head of a clay figurine of the 12th century bc from the Vlychos area. 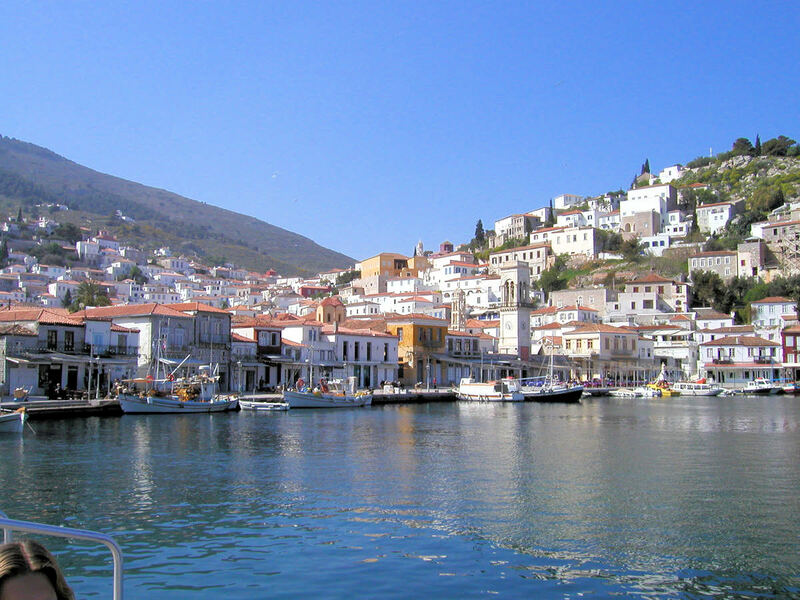 There are several ancient amphorae retrieved from the sea-bed around Hydra. Upper floor: main gallery. The centre-piece of the room is the heart of Andreas Miaoulis conserved in a solid silver lekythos. Around the walls is a wide selection of portraits—many of the best painted by unknown artists— of Hydriot freedom-fighters and seamen; this complements the remarkable collection of earthenware plaques with portraits painted of the ‘fire-brands’ of Hydra, which are assembled on the wall be side the staircase. ‘Fire-brands’ were the young men who hazarded their lives in the risky operation of attaching a fire-ship to an enemy naval vessel and detonating it, after making a rapid withdrawal to safety. This was the technique used by Constantine Kanaris to destroy the Turkish flag ship at Chios: it became one of the Greek Navy’s most powerful weapons. A large model of one such vessel— usually a converted type of a merchant brig—is displayed in the room adjacent to the main hall. The ships’ portraits around the walls have considerable variety—some documentary and detailed, others picturesque with often interesting light effects. Dominating the hall from the rear is an example of the independent Hydriot Flag—blue, with a white cross (faith and suffering), a snake (endurance) and an owl (wisdom). The landing and back room exhibit a number of wooden figureheads and prow decorations. The cases display an important collection of swords and pistols, and of ceremonial costumes, including an exquisite example of a *lady’s embroidered over-gown, or cape, called a ‘pirpiri­’. At the top of the stairs are the original 18th century, wooden doors and ceiling decorations from the Voulgaris Mansion. 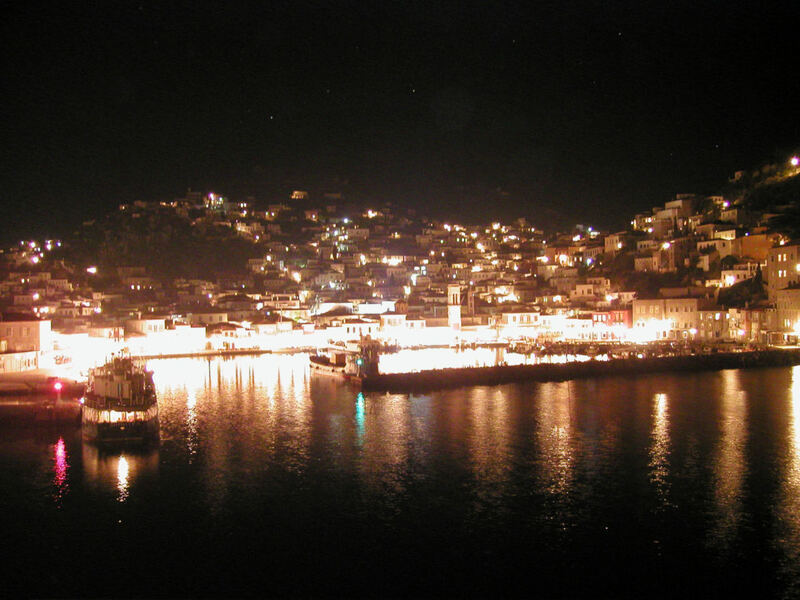 From the promenade in front of the Museum several of the principal family mansions, or ‘archontika’, of Hydra can be seen. Immediately to the left, the next building along the harbour front, which now houses the Greek Merchant Naval Academy, is the Tsamados Mansion (c.1790). This, and the Tombazis Mansion, directly across the harbour, are both tower-like constructions set within high enclosure-walls whose irregular contours, following the shape of the hill, contrast pleasingly with the severe rectilinearity of the buildings. 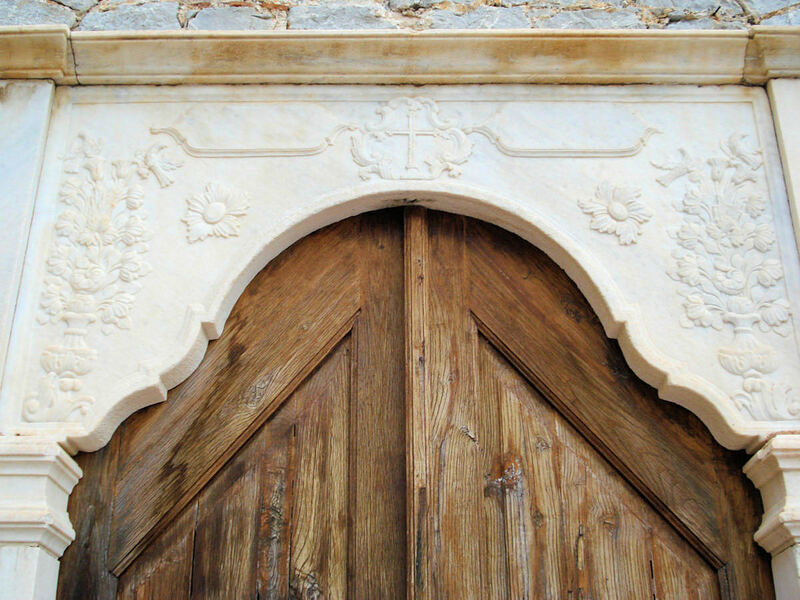 The Tombazis archontikon, which is now home to a branch of the School of Fine Arts of Athens, has—as is often the case with Hydriot mansions built on the steeper slopes—several entrances on different levels: the principal one on the upper (fourth level) has a beautifully carved marble surround. 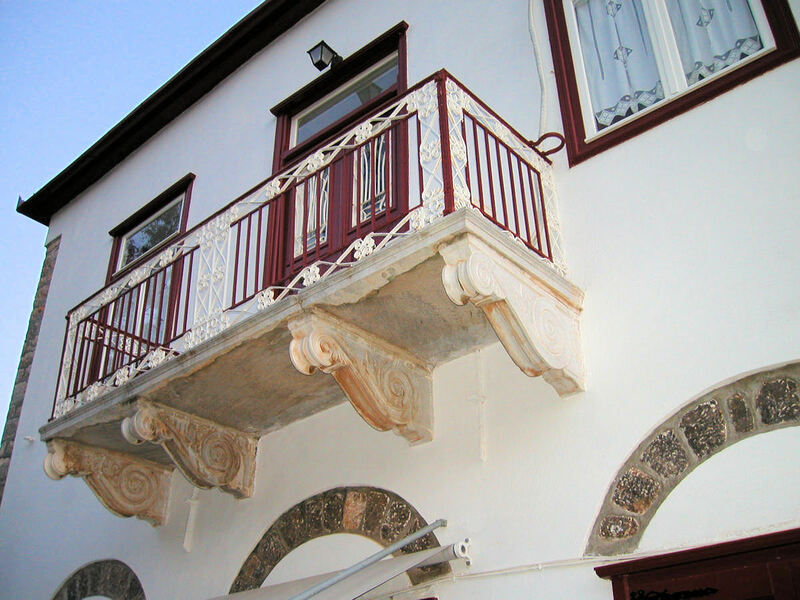 Prominently visible to the right of the Tombazis mansion, dominating the hill which forms the western projection of the harbour area, is the classically pure, four-square Voulgaris Mansion, symmetrical and almost identical on every face: the only decorative relief is provided by the ‘brows’ above the windows. 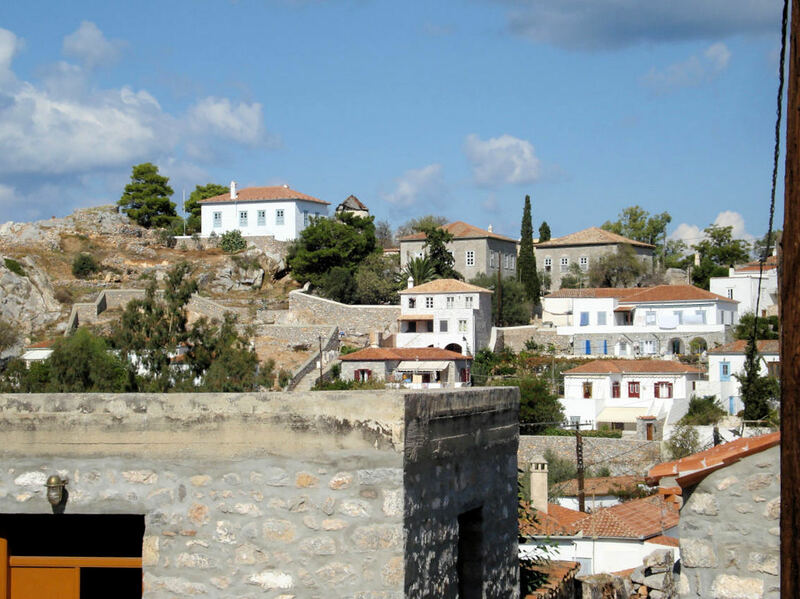 The mansion was built by Giorgios Voulgaris, Governor of Hydra between 1802 and 1812. 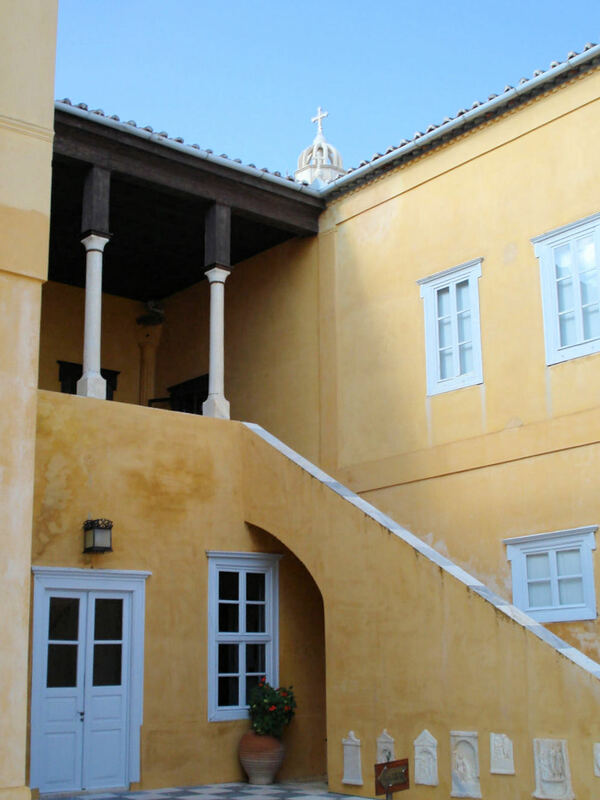 Conspicuous by its distinctive yellow stucco and upper-floor loggia is the Koundouriotis Mansion, high up on the western hill to the southwest of the port: this, and the Gouroyannis Mansion (not visible from here: at the southeastern extremity of the town by the well-heads of Kala Pigadia), to which it bears many similarities, are probably the old est of the archontika, and date from the period 1780–90, when, with the increasing importance of the port and its ships to the economy of the island, the settlement began to fill the area below the plateau of Kiafa. Of particular note are an 18th century icon of the Virgin of the Roses with contemporary, ornate frame, and a delicate 16th century image of Aghia Paraskevi, hidden in the farthest room of the collection. There are two good examples of 18th century Ottoman firmans, ‘sealed’ with the ornate, gilded monogram, or tuΔra, of the Sultan. A curiosity of the collection is the strongly westernising image of the Lamentation (1770) on a rectangular panel of canvas, which functioned as an epitaphios—the banner carried in the Easter procession of Holy Saturday. The offices of the Town Hall occupy a part of the Monastery buildings, including its principal reception hall which has a superbly decorated ceiling. It is possible to see this by asking at the Secretary’s office on the first floor. The streets that radiate inland from the esplanade all originated as torrent-beds for the drainage of water from the mountain, and still perform this function today when it rains. For this reason they are designed with elevated side-walks and deep kerbs. One of these, Votsis Street, passes to the west of the cathedral church, and opens out after 100m (heading away from the harbour) into Votsis Square, overlooked from the south by the dignified 19th century building of the Hydroussa Hotel (ex-Xenia) and from the west by the island’s hospital. 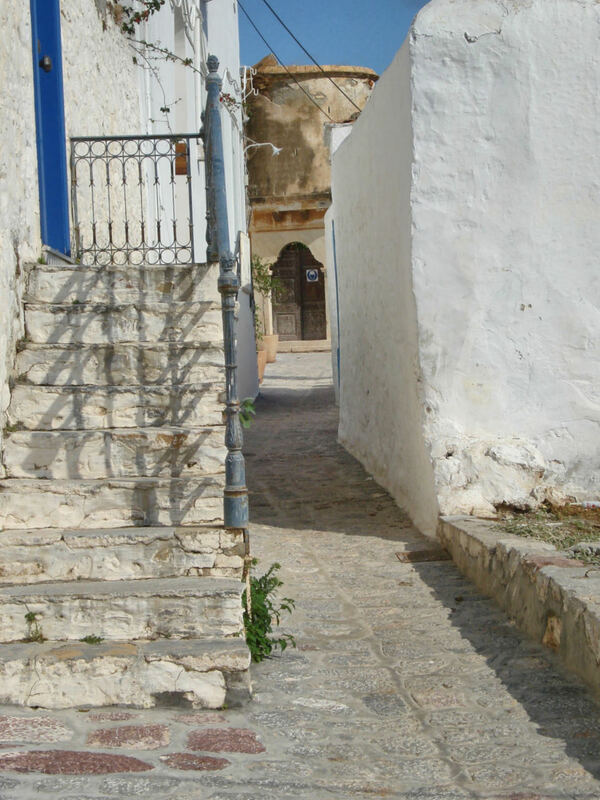 From the south side of the hospital, steps lead up steeply to the Koundouriotis Mansion, which is open to the public as a museum and historic residence. 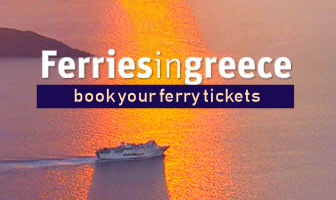 (Open daily Apr–end Oct 9.30– 3.30. 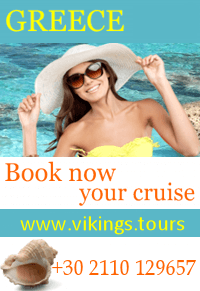 Visits can be made at other times of year on request: T. 22980 52421, or 210 323 7617.) The beauty of the house, which dates from c. 1780, lies mostly in the spacious pro portions and elemental simplicity of its principal rooms and furniture—characteristics it shares with several of the houses of the founders of the early American Republic, whose tranquil atmosphere it recalls. LAZAROS KOUNDOURIOTIS (1769–1852) was the leader and political representative of the principal families of Hydra in the period of the Greek War of Independence. He inherited a successful shipping and trading business from his father, and later committed a very large part of the wealth which it represented to the Greek revolutionary cause, its navy and its practical needs, from 1821 onwards. He furnished both ships and moral guidance to the independence movement. 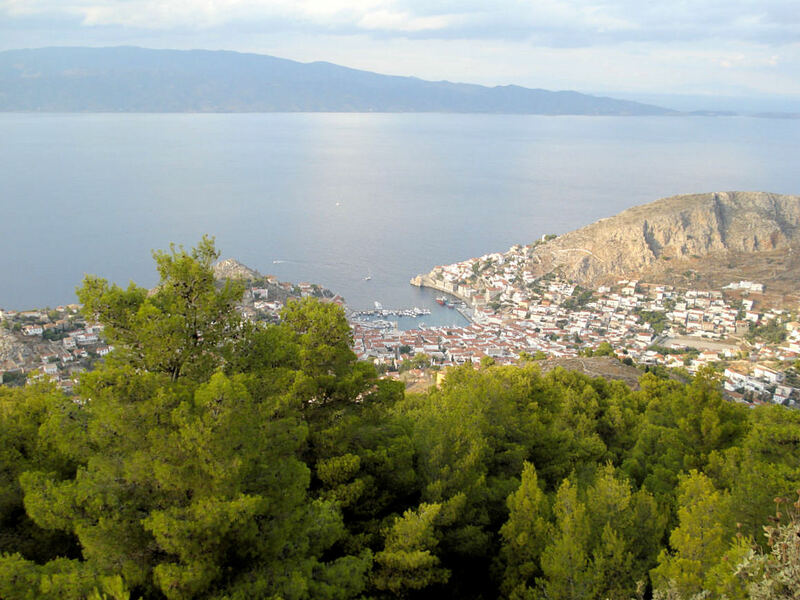 It is said that he only left the island of Hydra on one occasion. He had 14 children of whom eight survived to adulthood. 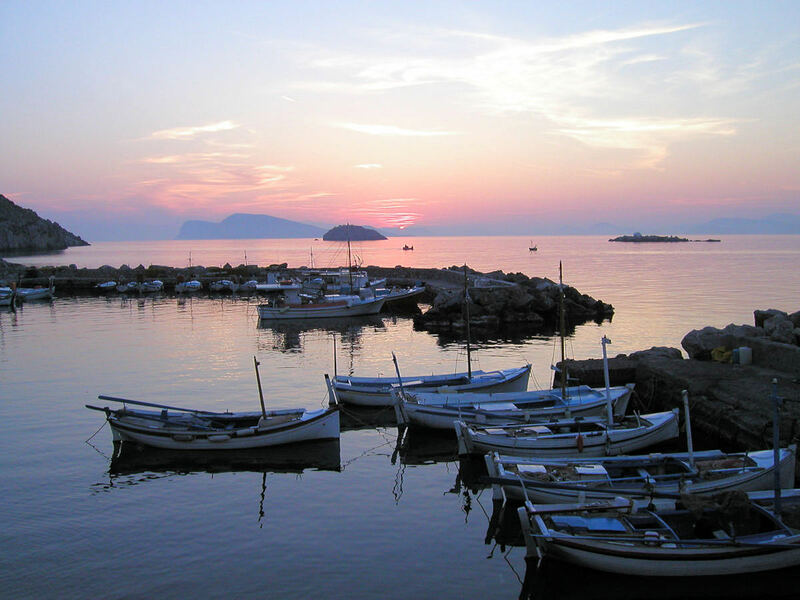 Many of his descendants have been prominent in politics and in the Greek Navy. The main entrance leads into a courtyard below the pillared loggia of the upper floor. It is often maintained that these early Hydriot buildings are built on designs by Genoese architects: the contrast here of the elegant loggia with the severe and undecorated exterior, is certainly northern Italian in inspiration. 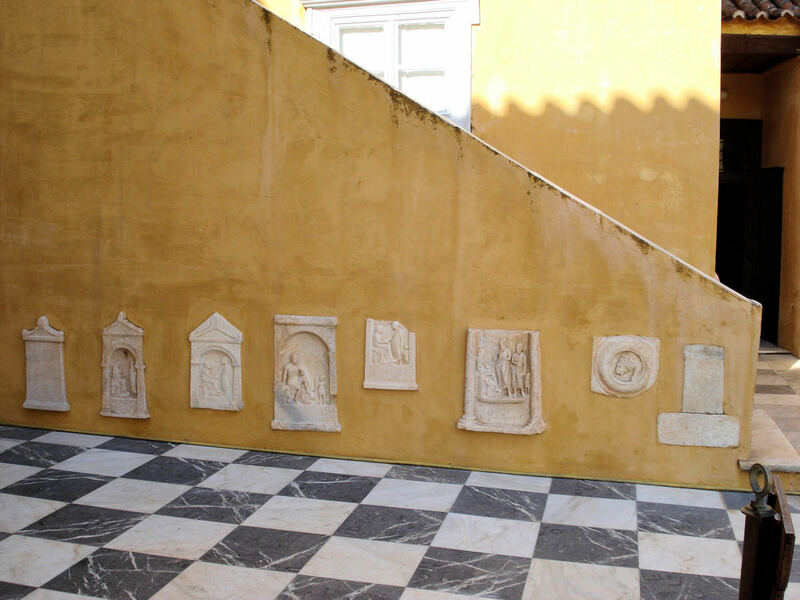 A number of Hellenistic and Roman funerary stelai and reliefs, probably found on the mainland opposite, are immured below the staircase to the right of the court. An airy yet stately *vestibule runs the width of the interior. Below its floor and that of the courtyard are large water-cisterns: the beautifully carved octagonal drinking-fountain above one of them stands to the right of the main door, supplying water directly to the area of the public rooms. This is a feature in common with many of the other larger mansions in the town. 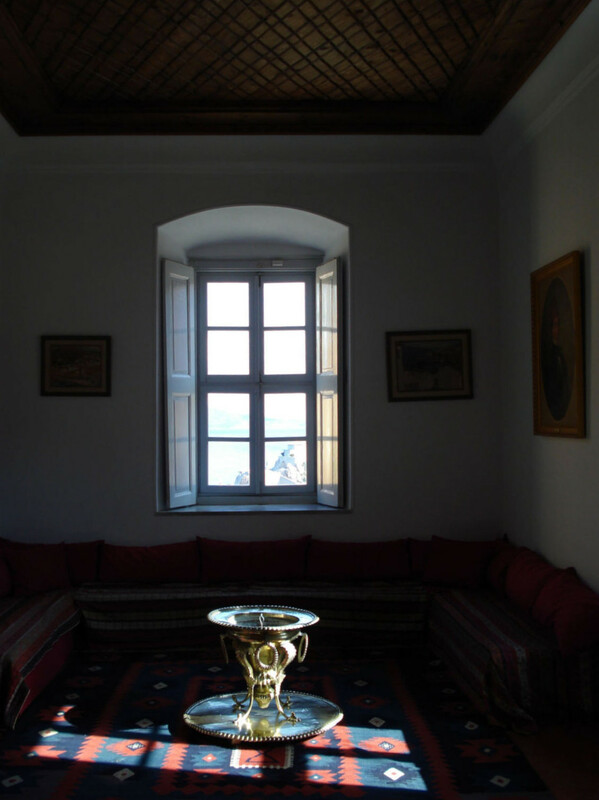 The main rooms leading off the vestibule are all characterised by high ceilings, fine proportions and a simplicity of furnishing in a mixture of Ottoman and Western style: the simple elegance of the cypress-wood door-frames and other fitments is notable. Placed above the east-facing door onto the verandah is the long panel of family icons. In the main hall is a full-length portrait of Lazaros Koundouriotis: the sash and cross have been added at a later date. 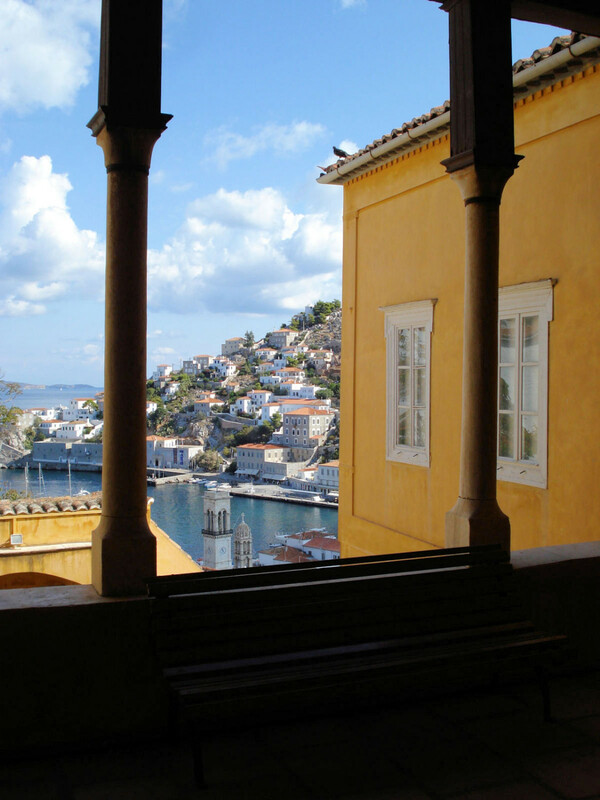 The upper floor rooms are grouped around a panoramic loggia of simple design, which commands views over the whole town and port: they contain a display of furniture and (mostly female) ceremonial *costumes from different parts of Greece— elaborate and beautifully coloured skirts, and brocaded jackets. 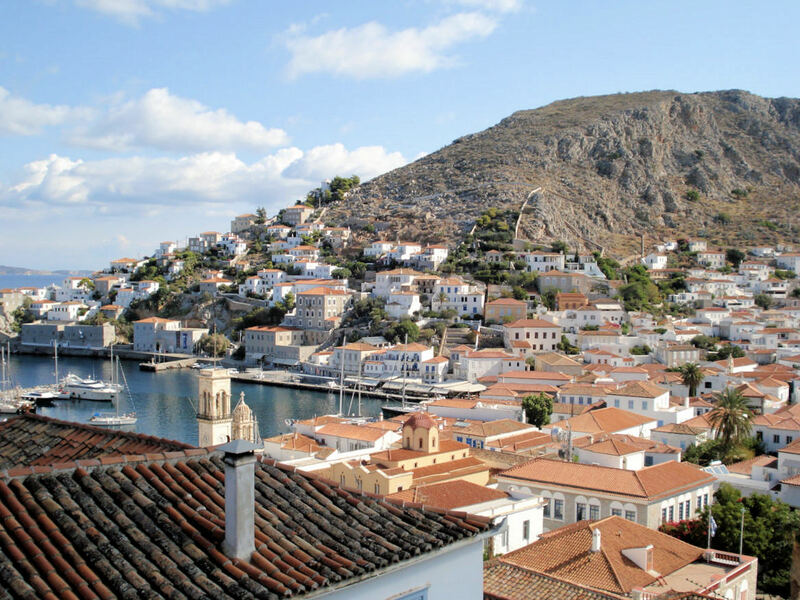 Those in the last room, representing the three ‘naval islands’—Psara, Hydra and Spetses—are perhaps the most delicate of all. The bakery and cellars in the undercroft can also be visited, where a permanent exhibition of the works of the painters Constantinos and Perikles Byzantios (father and son) can be visited. 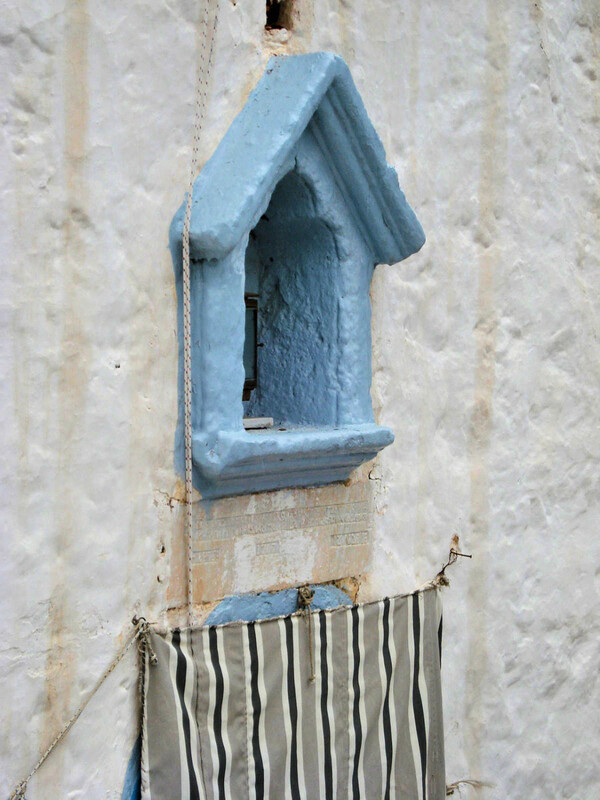 Directly above the Koundouriotis house is the church of the Ypapanti, or ‘Purification of the Virgin’; by following the street as it climbs to the south amongst attractive houses, past the smaller churches of St Spyridon and then St. Tryphon, you come to a point where another street crosses at right angles. 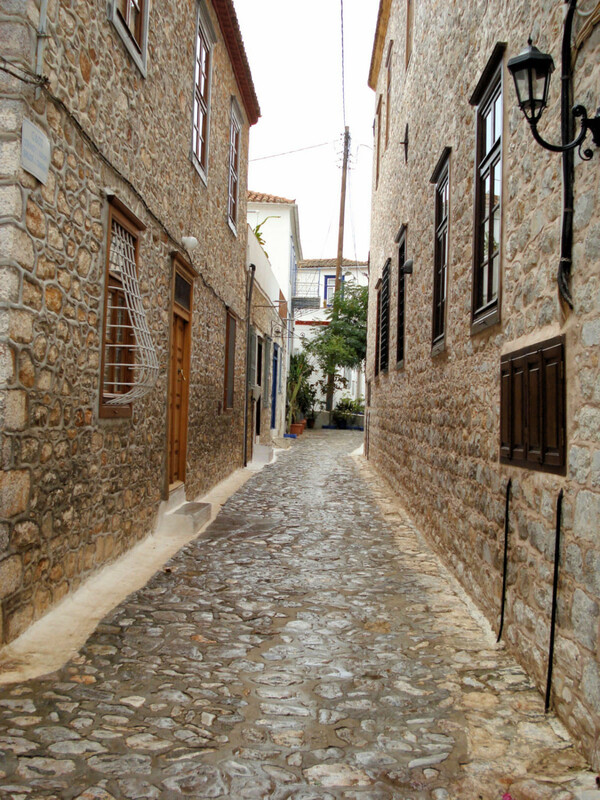 This is Kriezis Street which traverses the upper town from east to west, and leads down a shaded and broadening valley to the west, finishing at the shore once again at the fishing settlement of Kamini. Continuing straight on across Kriezis Street, you climb to the church of the Tris Gerarches, whose unappealing exterior is compensated for by an attractive 19th century painted iconostasis and marble floor-decorations in the interior. 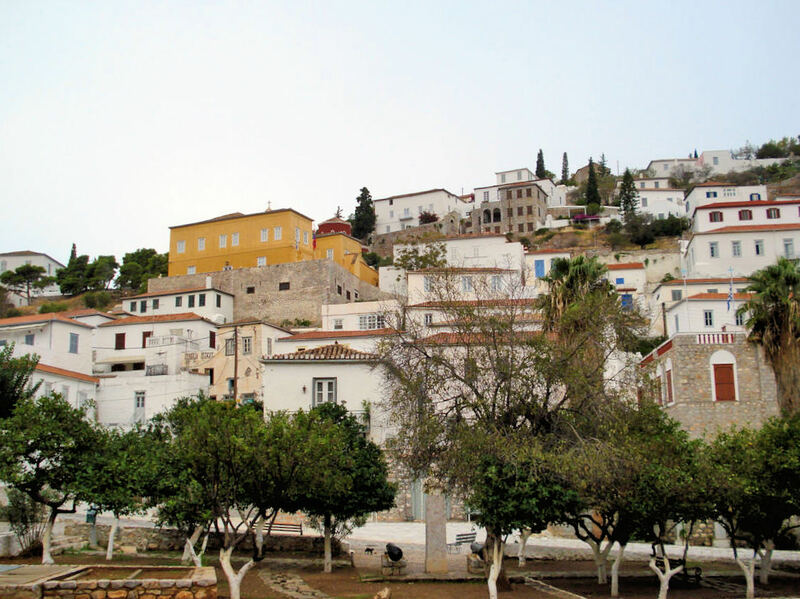 The area south of here is the heart of the original settlement of Hydra, called ‘Kiafa’, which was first occupied in the early 17th century—if not before: it is grouped around what is probably the town’s oldest church, Aghios Ioannis Prodromos. (The church is c. 150m uphill to the southeast of the Tris Gerarches: the key is currently kept in the house immediately to the right of the western gate into the church’s precinct.) The original cross-with-dome design is from the 17th century, but the church was renovated in 1783. It is the only church on the island to have a complete cycle of wall-paintings in its interior: these date from the late 18th century as does the church’s carved, wooden iconostasis. 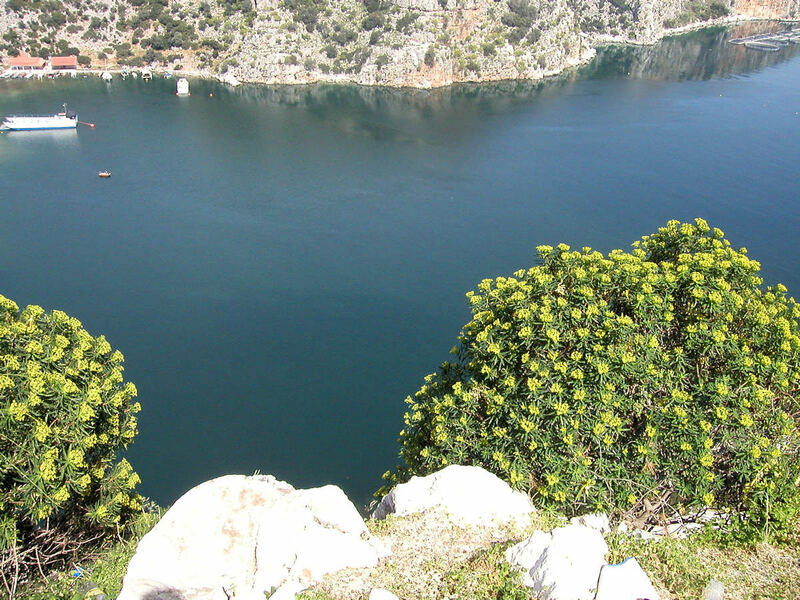 By climbing a short distance beyond the church and then following the main path left, it is possible to descend from Kiafa to the east, towards Kala Pigadia. As you descend the final stretch of stepped path, the large, yellow archontikon in the valley below, with a central loggia similar to that of the Koundouriotis house, is the Gouroyannis Mansion, whose construction also dates from c. 1780. The heterogeneity of its roofs and the irregular projection of the loggia give it considerable charm. The name ‘Kala Pigadia’ (‘good wells’) refers to the two ample well-heads around which the terraced square is constructed. 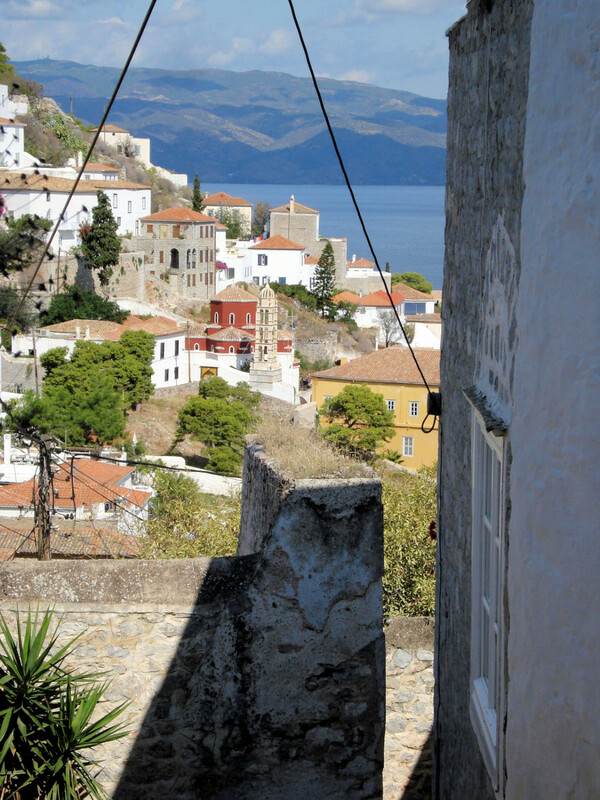 These were dug under the governorship of Giorgios Voulgaris at the turn of the 19th century: together with the wells at Kamini, they were the principal source of water for the town of Hydra and supplemented the cisterns beneath every house which stored winter rain-water. 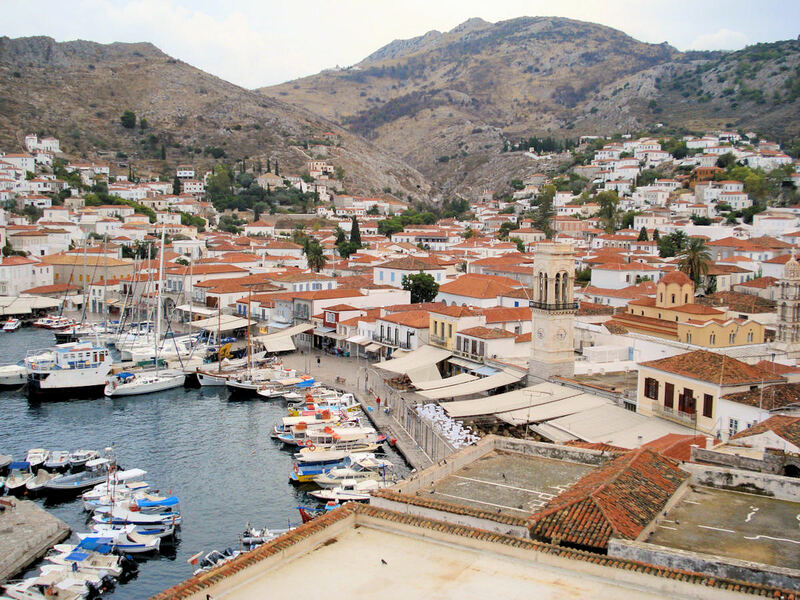 Today fresh water is shipped daily to Hydra from the mainland. 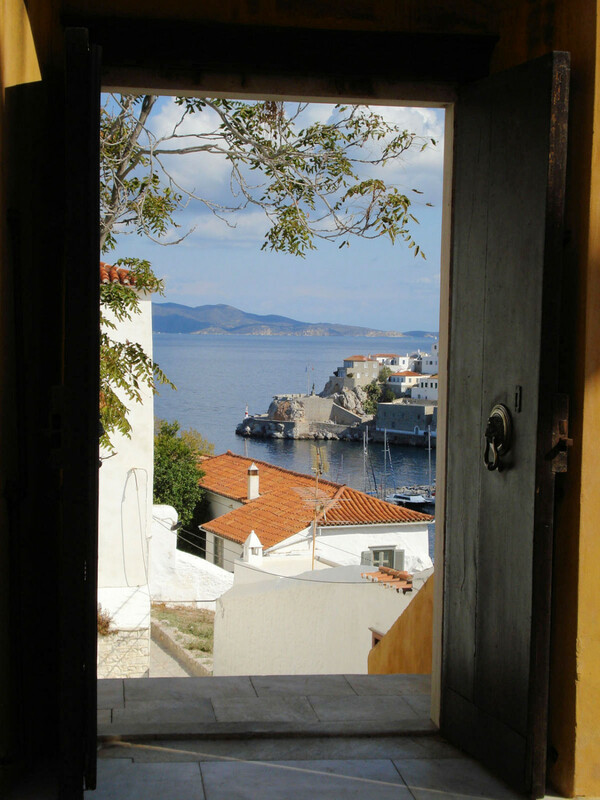 From Kala Pigadia, the wide, stone-paved, Miaoulis Street leads downhill to the harbour again; its route is lined with substantial houses of the early 19th century, a couple of which are entered through colourful neoclassical doorways, added at a later date. 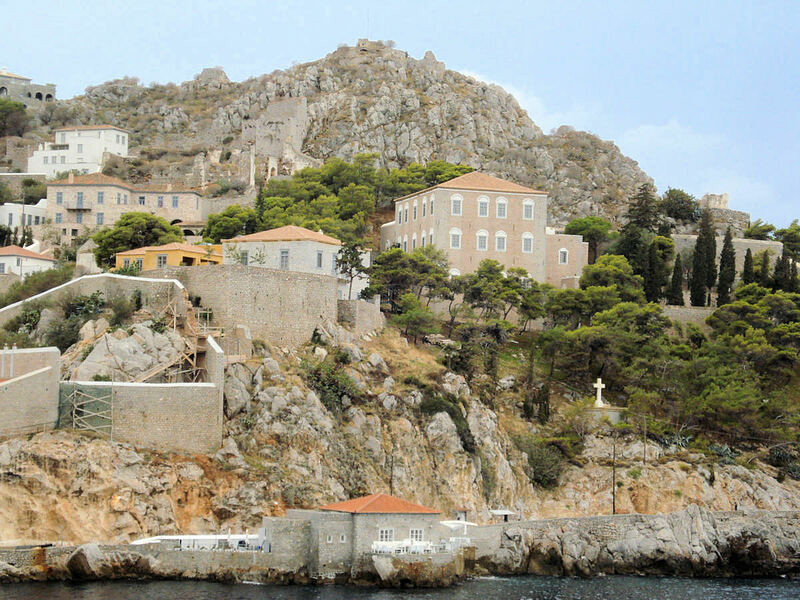 Alternatively, by circling the Gouroyannis Mansion and continuing to climb, you reach the monasteries above the town. 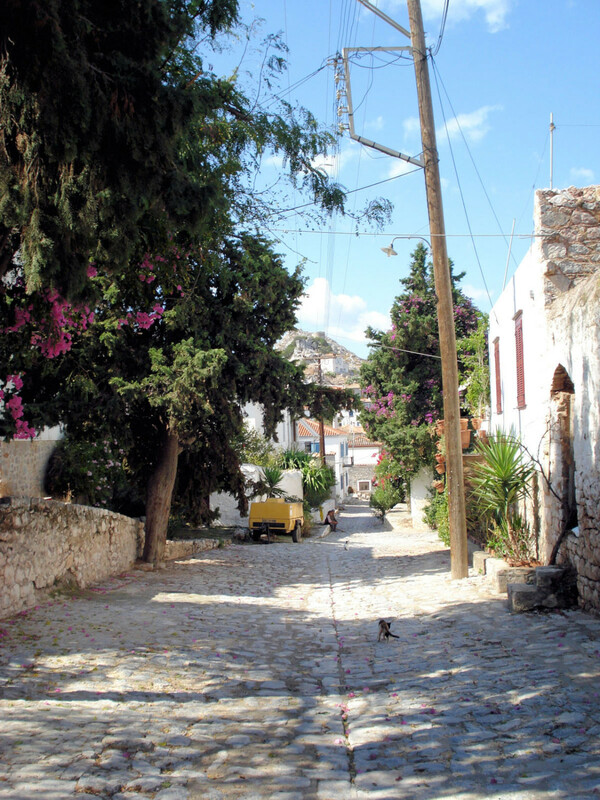 Hydra Island, total ban on motorised trafic. 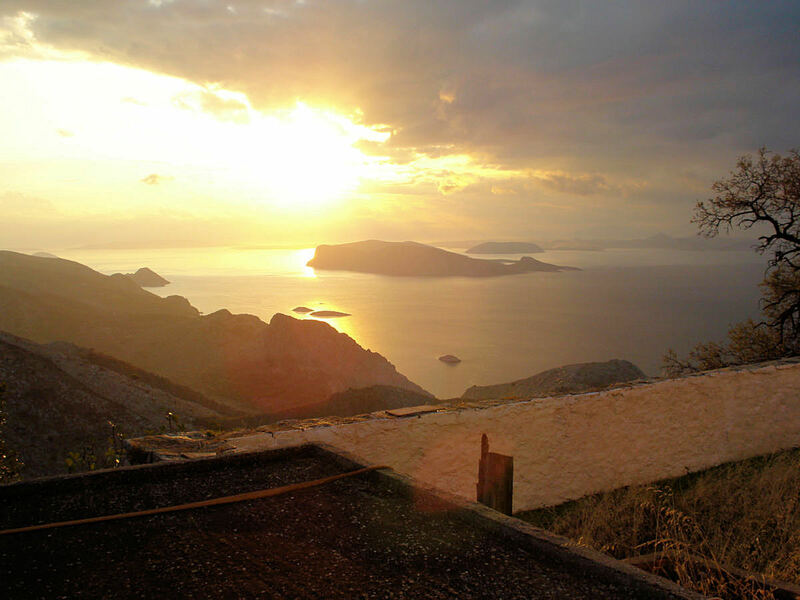 Small and characterful, the most pleasant hotel on Folégrandros is the -Kastro Hotel in the heart of the old Kastro, with raftered rooms, traditional furniture and beautiful views (open Apr–Oct, T./fax. 22860 41230, www.hotel castro.com). 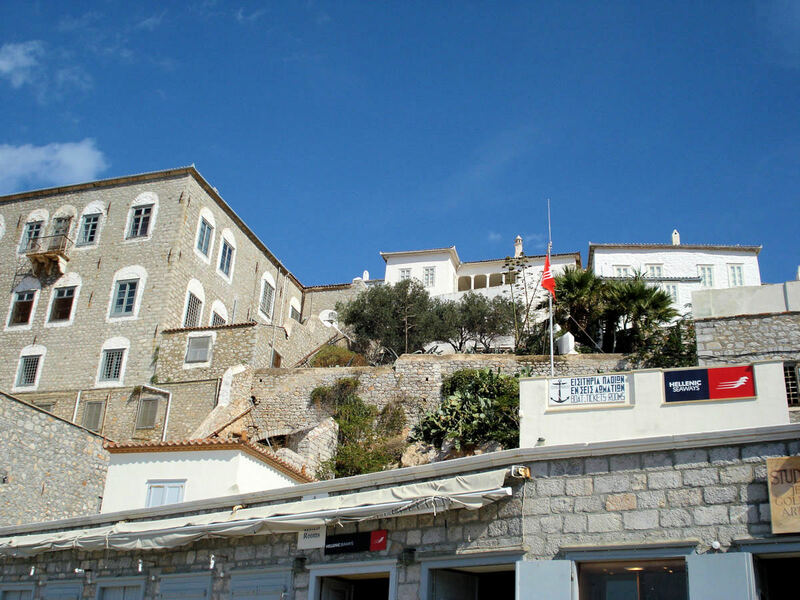 Anemomilos Studios (T. 22860 41309) and Artemis Rooms (T. 22860 41313), both at the beginning of the road up to the church of the Panaghia, are simpler, but pleasant and panoramic.Small and characterful, the most pleasant hotel on Folégrandros is the -Kastro Hotel in the heart of the old Kastro, with raftered rooms, traditional furniture and beautiful views (open Apr–Oct, T./fax. 22860 41230, www.hotel castro.com). 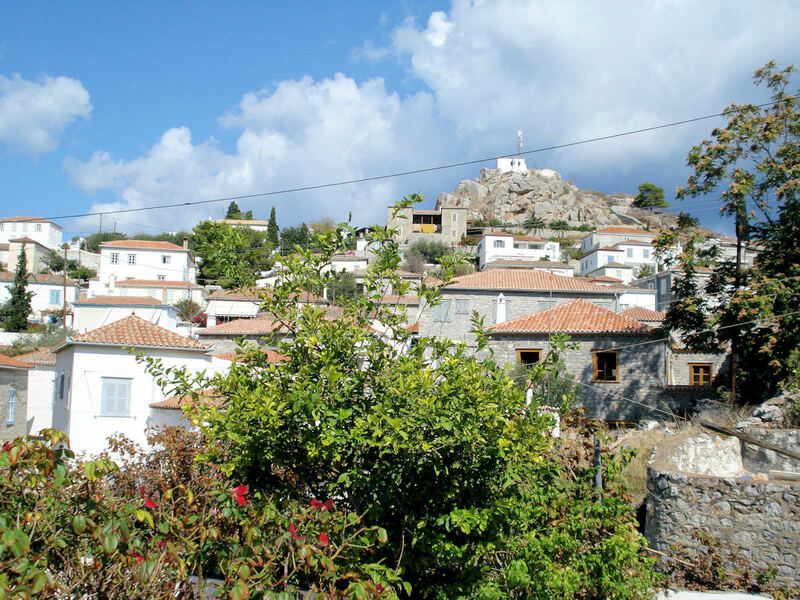 Anemomilos Studios (T. 22860 41309) and Artemis Rooms (T. 22860 41313), both at the beginning of the road up to the church of the Panaghia, are simpler, but pleasant and panoramic. 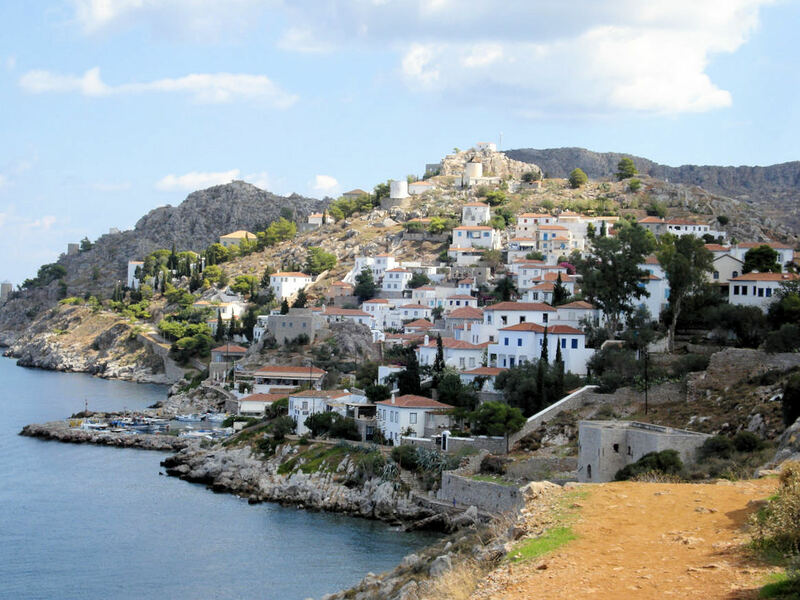 Eating can be surprisingly unimaginative on Hydra by comparison with the high quality of the island”s hotels; there seems little ambition to do more than the regular fare. One of the nicest and most welcoming places, offering fresh and varying proposals in Greek cuisine every day, is Kristina”s (properly “Chrysina”s”) “Gitoniko”, in the alleyway close by, and to the right of, Stavros Douskos”s long-standing and famous taverna, Xeri Eliá. The latter also has reliable food served on tables beneath the trees in the square; but it is a more commercial operation. 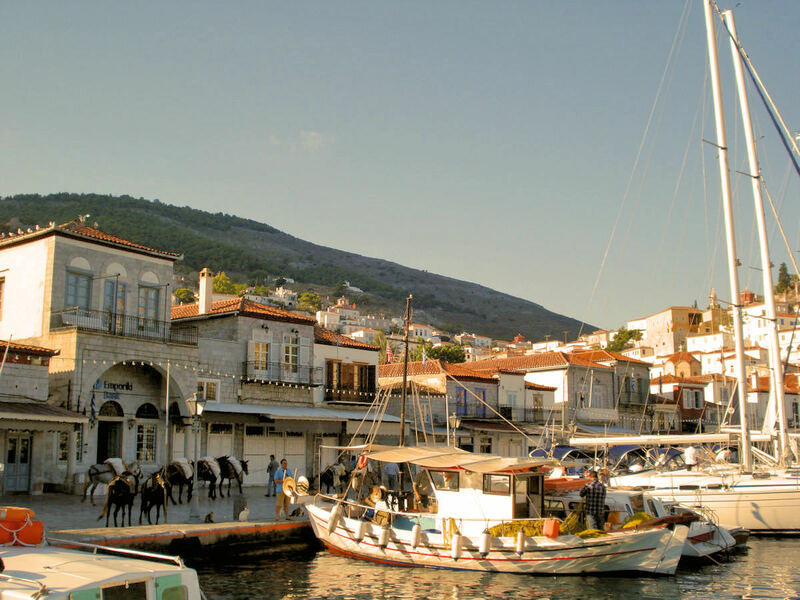 To Steki, near Votsi Square, has straightforward fare, and an attractively “un-reconstructed” interior with folk-murals of ships and boats on the walls. 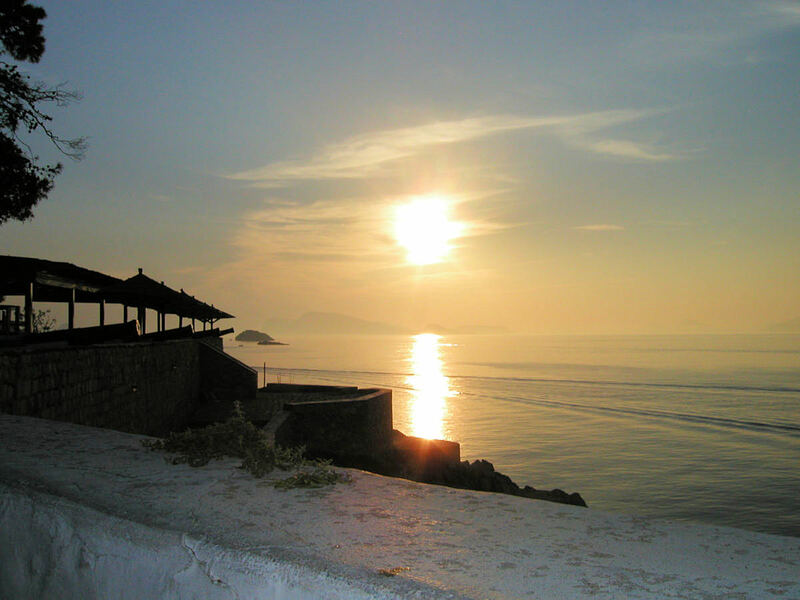 At Kamini (15 minutes” walk from the main harbour) Kontylenia”s taverna, has pleasing views and some imaginative dishes.